So, a juxtaposition of Baishizhou and Denali, which may be achieved through visual flattening, but as lived required movement through time and space — from Shekou to Hong Kong international by way of Shenzhen Bay checkpoint to SeaTac and then on to Anchorage and passage on the Alaskan Railroad. There is, of course, the eye of the beholder — mine — which seems drawn (here, at least) to pink, but all this does is raise the question of whether or not what I experience in each of these places is what other people also experience. In Chinese poetics, this common — unquestionably and recognizably human — response would be called yijing (意境), which literally means “idea scape” and denotes the moment of union between interior and exterior states of being. 意, for example, is composed of characters meaning “sound (音) and heart (心)”, while 境 is composed of characters for “earth as soil or land (土)” and “final or complete (竟)”, which here functions as a sound marker for jìng. These questions matter because both Baishizhou and Denali are the focus of conservation efforts, albeit of a different ilk. Both discussions assume a common response to a particular environment. Moreover, in both discussions, one’s response to the environment is taken as an expression of one’s humanity and there, of course, is where the debate rages. At Baishizhou, the current discussion of how to raze and rebuild an urban village focuses on the experience of mass urbanization and the need for access to housing, food, and transit networks. The debate has two assumes. First, the debate assumes that inequality is a defining feature of human life and that the purpose of social life is to ascertain that level and take measures to insure that people do not live in inhuman conditions. In turn, the content of the debate is over where to draw the line between human, subhuman, and inhuman living conditions. Second, the debate also assumes that urban living is a desirable form of life because it results in access to cultural goods, such as medical care and education by way of intentionally crafted environments, such as hospitals, schools, restaurants, and entertainment districts. As debated, these two assumptions are hierarchically ranked into the Maslovian categories of “basic needs” and “higher needs”. Thus, as one debates, one is not simply drawing lines between this life and that, but also and more importantly, revealing one’s humanity as a function of social responsibility. Likewise, at Denali a general assumption and its implementation shape debate, but here over the nature and value of wilderness. On the one hand, the debate assumes that the experience of wilderness reveals and cultivates the wild, untamed spirituality that makes us human and that the purpose of social life is to maintain and create spaces where people can realize this spirituality. In turn, one’s love of wilderness functions in this debate as a marker of one’s spirituality. On the other hand, the debate also assumes that wilderness occurs in the absence of human settlements, such that in order to build human settlements one must transform wilderness. As debated, these two assumptions are also ranked hierarchically in terms of what is essentially human (nature) and acceptable transformations of wilderness (culture). Thus, as one debates, one is not simply drawing lines between this life and that, but also and more importantly, revealing one’s humanity as a function of wild spirituality. It is possible to note the Chineseness of the Baishizhou debate (all that Confucianism going down), just as it is easy to remark on how much Emerson and Muir continue to shape American understandings of our place in the world. And therein lies the challenge of cross-cultural debates about what it means to be human in a world where Baishizhou and Denali cross paths, so to speak. The question is not so much either / or — which is a more accurate definition of what it means to be human: social being or wild spirituality, but rather the question seems to be: what might the Baishizhou debate teach us about the cultural place of wilderness, and what might Denali remind us about the limits to human settlements? 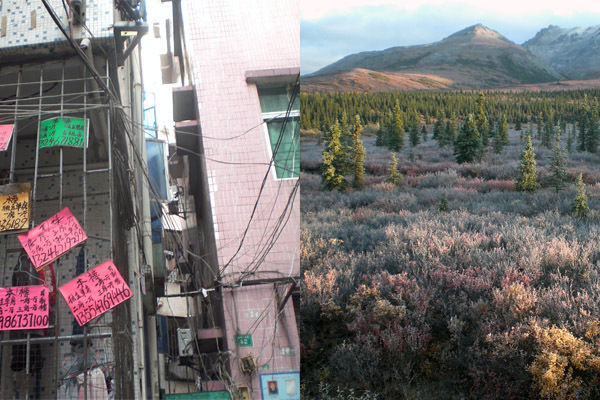 This entry was posted in shenzhen elsewhere and tagged anthropology, baishizhou, culture, denali, exegesis, human universals, musing, nature, society, urban village, wilderness, 意境. Bookmark the permalink.